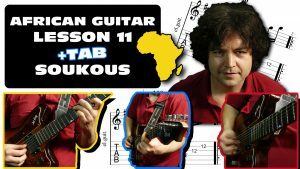 Fingerstyle soukous is a peculiar form within African guitar music; the following tutorial demonstrates an example of this style, with a sebene part included. 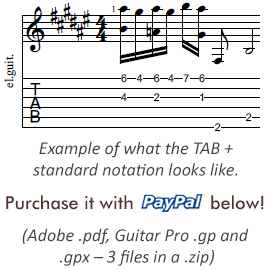 Don’t forget to download the tablature at the end of the article! The chord structure is I-IV-V-I for both parts. The tune is in the key of G major. The 1st part begins with a partial barré, fretted across the highest four strings with the ring finger. This arpeggiated riff outlines a G6 chord (actually an inversion of it, starting on the 5th note). The challenge here lies within the accuracy of the sequence; particularly in picking each note on an adjacent string with separate fingers. At the same time, you have to maintain the feel of the tune, so I suggest you not to try to play all four notes rigidly; maintain some feel with pocket loose enough to sort of float over the groove. Playing with fingerpicks and a thumb pick (as seen in the video) can help you achieve a well defined attack. There are a couple of slides in the first segment of the song, some of them are on a single string, but the more difficult ones are on two neighboring strings, forming double stops at the same time. The last one requires the most dexterity, because you need to move the middle finger right under the index finger from a diagonal position, while keep holding separate notes on each strings with both of these fingers. Try to practice this part with visualizing your wrist as kind of a fulcrum. The 2nd part of the piece, the sebene is executed way up high on the guitar’s neck. When it comes to soukous music, it’s often the case, so the musicians can create excitement and carry this energy to the dance floor. In our example, this section is mostly a melody line built out of single notes, but not entirely so. The “spice” element here is the employment of double and triple stops (3-string bar chords) that end the question & answer type phrases. The latter ones help adding a particularly jazzy feel to this guitar lesson. The ending dyad – a major 3rd – is played on the fatter lower strings. Even though it gives an interesting, sort of “muffled” vibe to the closing of the song, it doesn’t create a clash of harmonics, because it’s played high up on the fretboard, well beyond the 12th fret.